CSIS and the United States Naval Institute (USNI) conduct an interview with Admiral Karl L. Schultz, the 26th Commandant of the United States Coast Guard, conducted 1 August, 2018. Below I will attempt to outline the conversation, noting the topics and in some cases providing a comment. The first question is about immigration. Coast Guard is the “away game.” minimizing the factors that push immigration to the US. The Commandant does not expect a substantial increase in help from the Navy, because they are already heavily tasked, but would welcome any additional help. 06:30 Talk about Inland fleet. Congressional support is evident. $25M provided so far. 11:30 Human capital readiness? Operating account has been flat and effectively we have lost 10% in purchasing power. Want to increase leadership training. 16:30 Support for combatant commanders. 18:00 Capacity building and partnering. Detachments working on host nation platforms. 21:00 Defense Force planning–Not going back to the MARDEZ model. 22:30 Situation in Venezuela/Preparation for dealing with mass migration. 40:00 International ice patrol, still an important mission. 41:00 CG role in response to Chinese aggressiveness in the South China Sea. In discussion with Indo-Pacific Command. Will see more CG presence there. 49:00 African Capacity building/cooperation. May send an MEC. 51:30 Tech modernization. Looking at it more holistically. This interview prompted a couple of notable posts. SeaPower’s coverage of the discussion is here. They focused on the growth of demands on the Coast Guard. I have seen a couple of articles lately that claim a self propelled semi-submersible was seized off Texas. 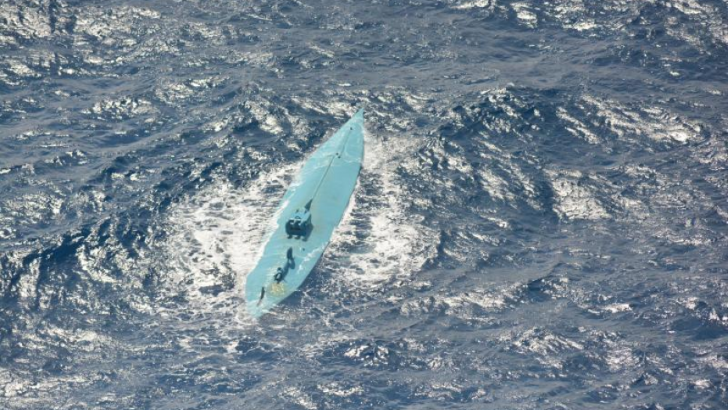 A U.S. Coast Guard cutter intercepted a self-propelled semi-submersible vessel engaged in smuggling more than 3,800 pounds of cocaine, federal officials said Sunday. According to the U.S. Customs and Border Protection (CBP), on November 13, CBP and Marine Operations (AMO) arrested the crew during operations in international waters (I don’t think this could be true–Chuck), and all three suspects will face charges in the U.S.
“The drug cartels are relentless and extremely innovative,” National Air Security Operations Center – Corpus Christi Director Allen Durham said. The multi-day operation from surveillance to interception, according to CBP, involved several interagency partners including the U.S. Coast Guard and the U.S. Navy. AMO operates maritime patrol aircraft from Corpus Christi, Texas, and Jacksonville, Florida, to conduct long-range aerial patrols and surveillance missions along the U.S. borders and in drug transit zones in Central and South America, according to CBP. These both appear to stem from a press release that originated in Texas from Customs and Border Protection, presumably the National Air Security Operations Center – Corpus Christi Director Allen Durham. Apparently the semi-submersible was detected by a CBP P-3. As far as I can tell, the interdiction, which apparently occurred on November 13, actually happened off Panama. If and when we ever get self propelled semi-submersibles going directly into the US, it will be a significant event with its possible implications for terrorism, but I don’t think we have any public knowledge of that happening yet.